There are many jobs in the market today. Unfortunately, though, only a handful of thousands of applicants often land these jobs. The reason for failing to get a job could be a poor outline in the structure of a job application. To make application easy and the chances of landing an interview easy, you might want to consider using a premade Application Forms. New job seekers almost always struggle to write their job application the right way. To many starters, the art of expressing oneself is often a difficult task. In the end, they fail to get calls for interviews, leave alone making it in the interview list. However, you can use an application for employment form 3285 to help you express yourself in the best way possible. Even if you are the best CV writer on planet, you will agree that writing an application for a job interview is not an easy task. You must also agree that sample employment application forms are the only tools that can help a job seeker secure an employment for sure. 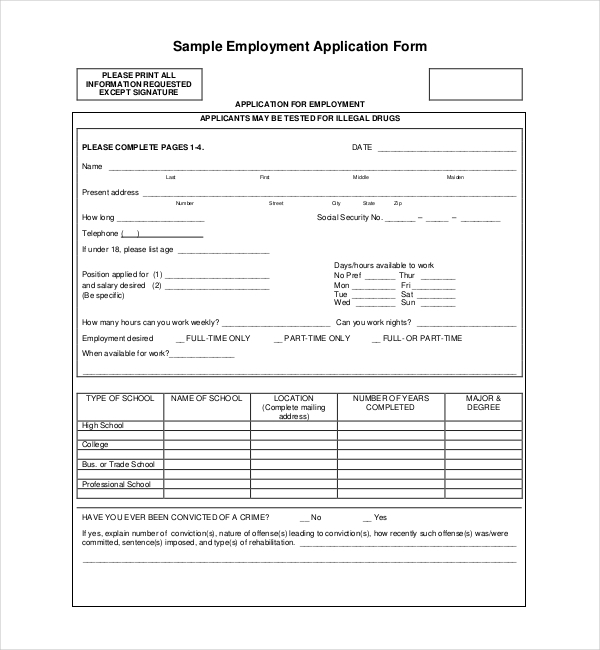 Therefore, a Sample Employment Application template will be best for you if you are seriously looking for a job. 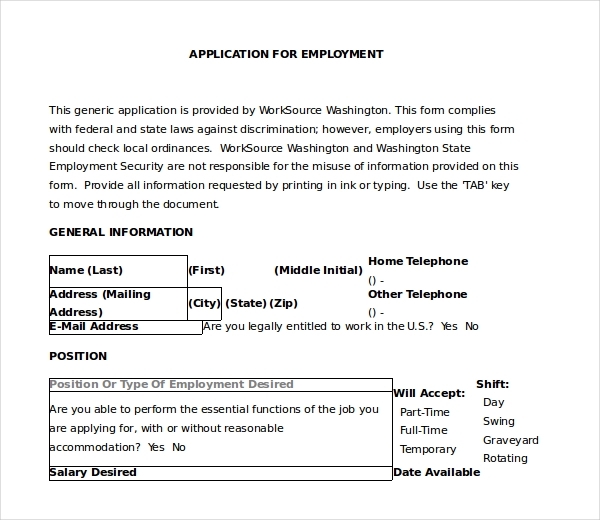 The Application for Employment Word Format is easy to download and customize. Although adding a little bit of personalization sounds like a good idea, it is not something you should do, to say the least. Unlike gift cards and birthday letters, you shouldn’t be adding any decoration to this form. The template has to be professional to win you a reply from a potential employer. A Church is a beautiful place; working in a place like this is not only rewarding but also fulfilling. However, people apply for church jobs and fail, particularly because they do not write their applications properly. 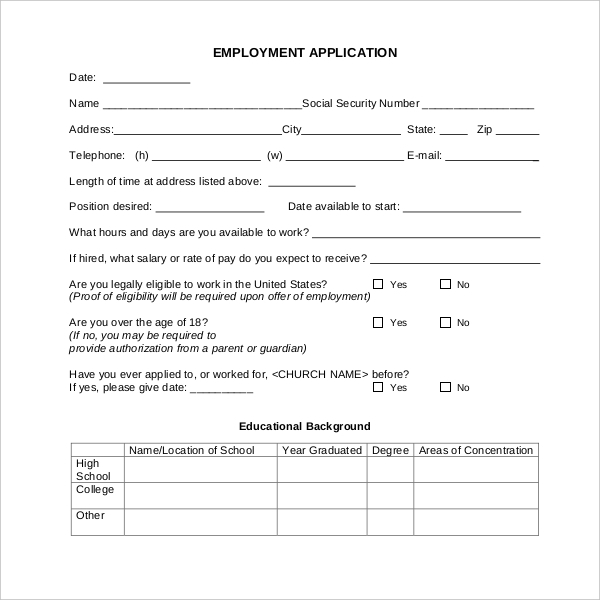 To help you write your application the best way, you should consider using a church application for employment form. The template is free to download and use. Working as a full time driver can be rewarding, but you have to start at the application stage to get the job. To apply for a driver job spotted in an advert or a newspaper, you will have to download an application form, fill it in, and send it to the potential employer. Once accepted, you will be asked to write your resume and cover letter. 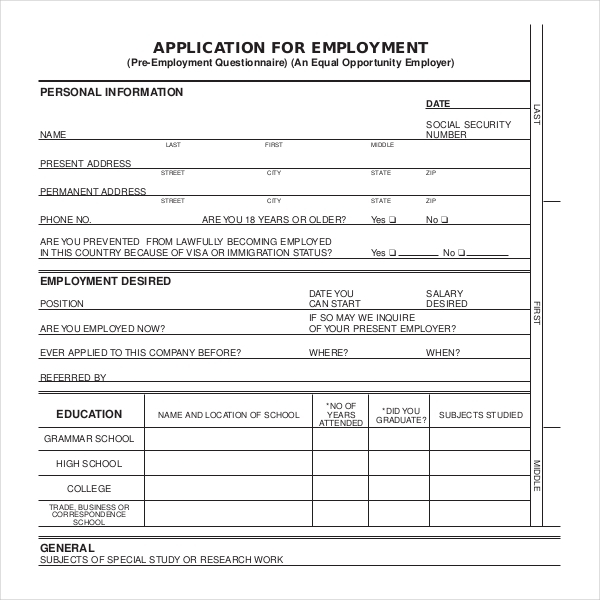 Even if you have never applied for a job before, you will find the Generic Application for Employment Form useful. 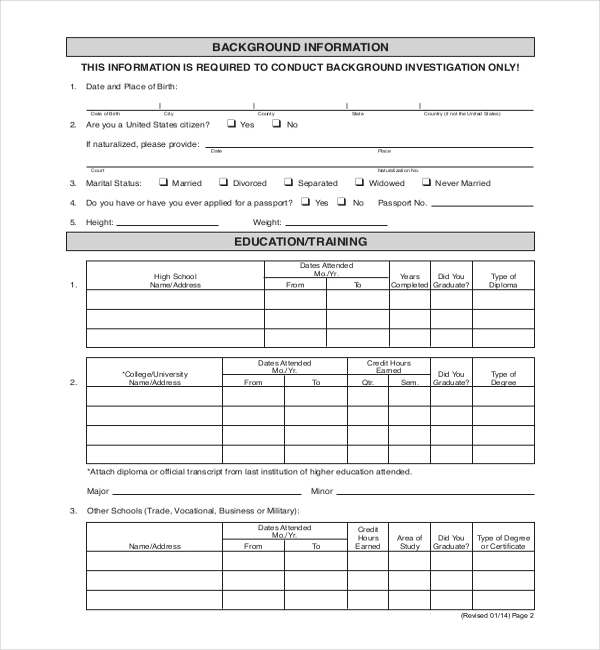 The employment form template is not only free to download, but also it is easy to edit. 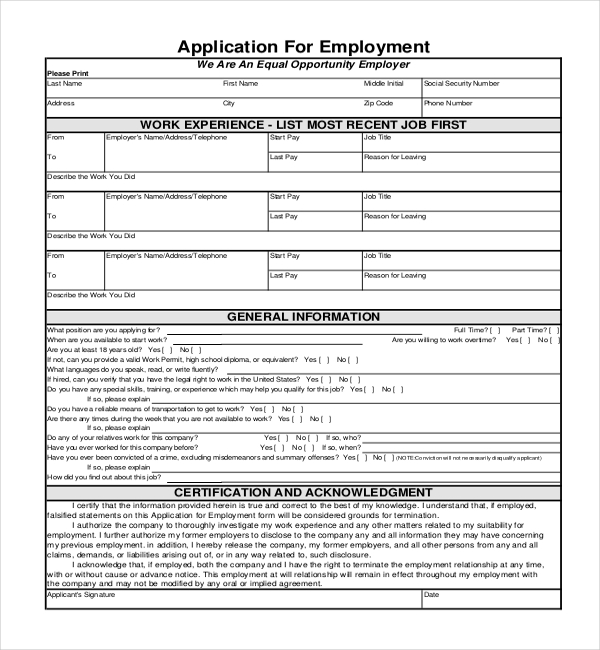 Because this is a general template, you can use it as a standard tool in applying for any type of advertised job. The template is free. 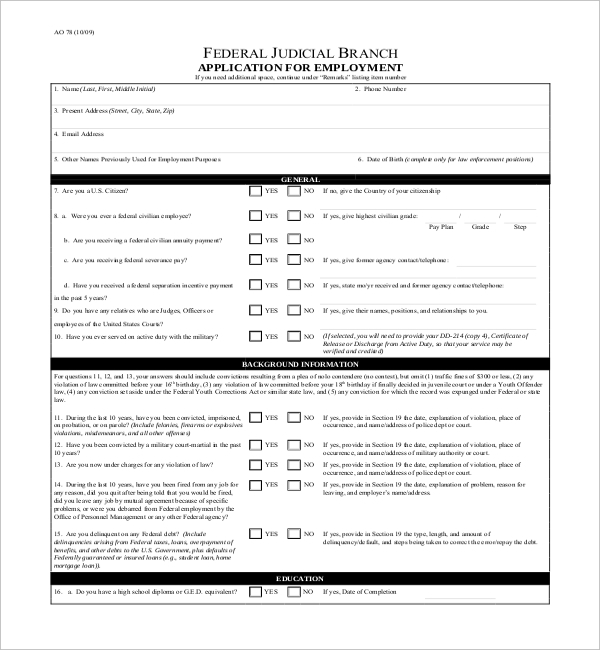 Besides being legible, the Judiciary Job Application form is easy to edit. The sample content on the template should be a sufficient guide to help you fill the form professionally. If you are stuck in the middle of filling in your details, do not be afraid to ask for help from someone who has applied for a job before. Download the template for free today. 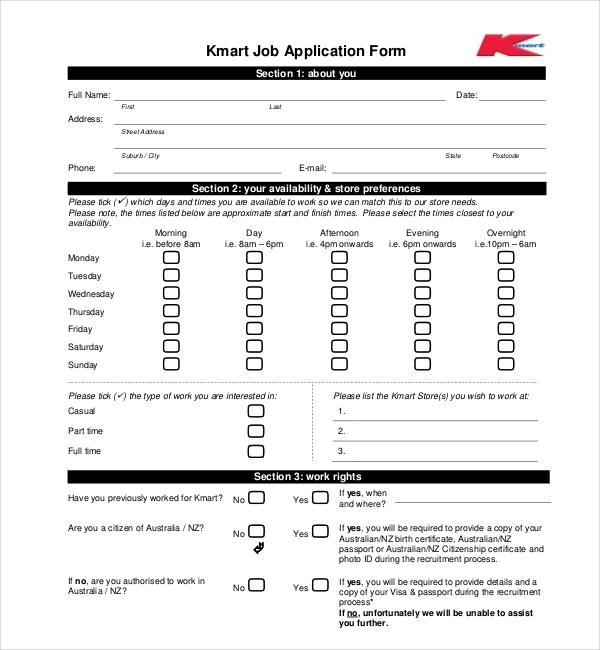 Kmart Application for Employment Form is free to download. It is the best template to use to make your job application easy. In fact, the reason why this template was created is so that you could have less time thinking about designing a form from scratch. 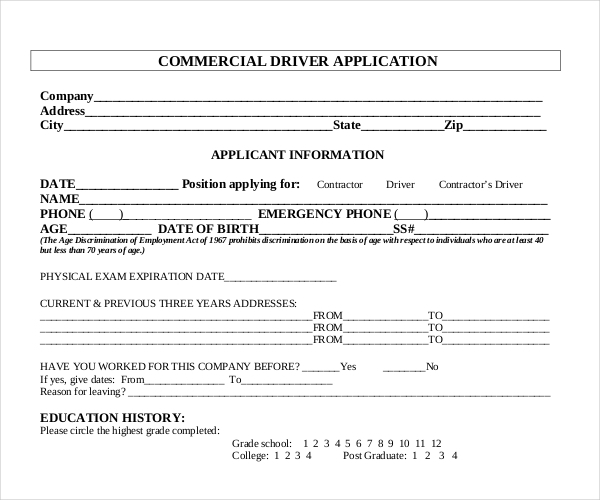 The form is easy to fill and easy to use. You can download it for free. Getting a job in the legal field is easier than before. The expansions of the economy and the need for progressive growth have created lucrative opportunities for experienced applicants. By using a legal application for employment form, you will be putting yourself in a position where securing a job interview is a guarantee. This template will make your job search easier than you thought. Working in a food joint can be fun – not just for the foods part though. If you have the passion for serving others in the eateries, working in a McDonalds might be the right job for you. Download a McDonalds Application for employment form for free, and use it to apply for the job in question. If you fill the form right, you will get a call that you are among those shortlisted for the interview. 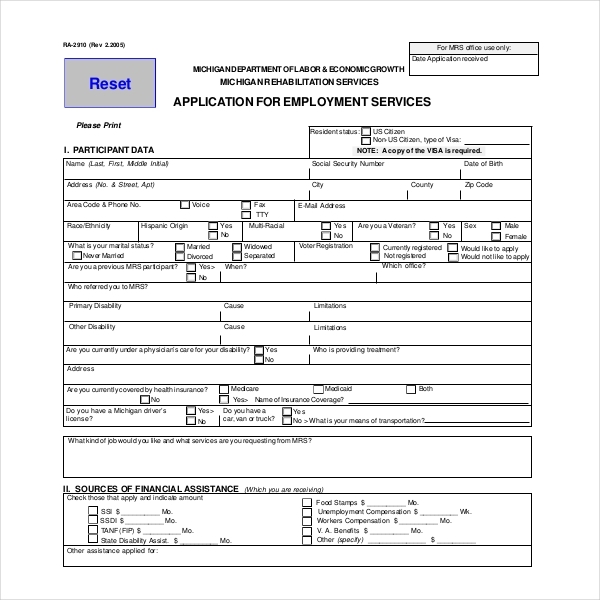 A Michigan Application for Employment form is free to download. Now, you might be tempted to customize this template. However, it is important to leave it as it is because it is already complete. This is not a gift card, so you should not change anything on it. Also, you should read the form carefully before you start filling in your personal and professional details. Recognize that templates are different, usually depending on the type of job in question. The form must, therefore, have details related only to the job that it describes. There should be enough space to allow details from job seekers.